At the same time, a heatwave swept into the country’s northernmost state: Anchorage, Alaska, tied a record high on Tuesday of 44 degrees (7 Celsius) — at the same time Jacksonville, Florida, was a mere 38 degrees (3 Celsius). Although temperatures have been lower in Indiana — the all-time low was minus 36 (-38 Celsius) in 1994 — the current frigid weather is unusual because of how long it’s lasted, experts said. 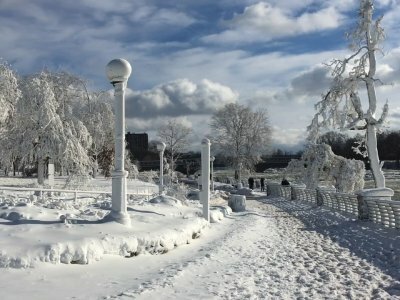 In Savannah, Georgia — where January’s average high is 60 degrees (16 Celsius) — the temperature hovered at 30 (-1 Celsius) at noon Tuesday. It was cold enough for icicles to dangle from the ornate wrought-iron fountain in Forsyth Park at the edge of the city’s downtown historic district. Associated Press reporters contributing to this report include Jim Salter in St. Louis; Jeff Martin in Atlanta; Russ Bynum in Savannah, Georgia; Rachel D’Oro in Anchorage, Alaska; Teresa Crawford in Chicago; and Seth Borenstein in Washington. How colder was it across the U.S. last week?